It's 2pm and the snow is falling steadily here in Cambridge, so I thought it might be an appropriate time to pass along my recipe for lentil buttercup soup, another gem in the soup arsenal that is thick and hearty and perfect for a day like today (luckily we have leftovers from last night!). 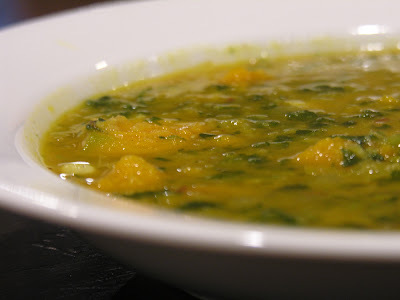 This recipe is really a glorified daal with sweet and starchy chunks of my favorite squash - buttercup - tossed in. On a whim I also added some frozen spinach, to add some color and some of the good stuff that leafy green vegetables provide. I tend to make this soup spicy, with lots of Indian flavors like ginger, coriander, cumin, chili, and cardamom. If you prefer a milder soup, you can opt out of the chili, but the other spices really make this soup special. 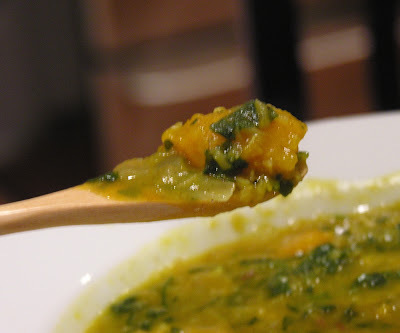 Although the squash itself is a bit sweet, the soup itself is not - it's very deep and earthy. I've only ever tried this soup with red lentils, because they cook in the blink of an eye and turn soupy enough that there is no need for a blender in this recipe. Try it with regular brown lentils if you dare, but don't say I didn't warn you. The recipe may seem time-intensive, because I roast the squash before adding it to the soup. However, the squash roasts in just half an hour, which is about the time it takes to chop an onion and cook your lentils. The soup is great on its own for dinner, with some bread or naan on the side, or try it as a prelude to another spicy, earthy, Indian- or Moroccan-inspired dish. Yum! Roast squash: drizzle with olive oil and season with spices, then roast in a foil-lined baking pan at 425 degrees for about 25 min., or until tender. In soup pot, heat 2 tbs. olive oil. Once hot, add cumin seeds and fry for a few seconds. Add onions and season with salt, pepper, and spices. Cook until softened, about 7 min. Add lentils, stir, add stock, and bring to a boil. Reduce heat and simmer, covered, until lentils are tender and starting to lose their shape, about 15-20 min. Add more stock, if necessary, to achieve desired consistency. Adjust seasonings and continue cooking until lentils are soupy. Add roasted squash and spinach, and cook until hot. This is FANTASTIC. I sort of improvised it, so it's probably not exactly like yours, but the flavour is wonderfully sweet and satisfying.